With the deadline now passed for a summer vote to extend taxes to balance the budget, the odds of an all-cuts state budget are rising. This would mean more pain for students, faculty, and staff at the San Mateo County Community College District. Well to be honest, there is nothing good about the budget, but there are things that could have been worse. There were no mid-year budget cuts or student fee increases, or further cuts in categorical programs (DSPS, EOPS, matriculation). The state legislature passed, and governor Brown signed into law, about $12 billion dollars in budget cuts. This includes a $400 million cut to community colleges, or 6% from the current (2010-2011) level. This will translate into about an $8 million cut for this district for next year. Student fees will also be raised by almost 40%, from $26 to $36 per unit starting in the fall. This will raise about $100 million statewide and $2 million in our district, which will offset some of the cut in state support for community colleges. There will also be more deferrals of moneys promised to schools, so that some of this year’s spending can be shifted to next year. This is one of the “smoke and mirrors” accounting tricks that the state is continuing to use to make the budget look balanced. However this means that schools will have to borrow more to tide them over until the state money comes. If the tax extensions don’t pass, if the legislature then approves an all cuts budget, and if they suspend Proposition 98 (which is supposed to guarantee a certain level of funding for K-12 and community colleges), then we could be looking at a $800 million cut in support for community colleges, which is about a $15.5 million cut in support for the district for 2011-2012. However, if the state cut in funding is more than about $9 million dollars, the district’s local property taxes and student fees would exceed the state funding base, so the district would be considered “basic aid”. More and more state school districts are falling into this category because the state is cutting education funding so much. The district would then be dependent primarily on local property taxes (which may also drop if property values continue to fall) and not on the state budget. District officials have said that the $6 million a year in Measure G parcel tax revenues and monies set aside for possible mid-year cuts would be enough to get by in 2011-12 with the reduced level of classes seen in last fall’s schedule. However, this could result in a drop of about 5% in student enrollment and major cutbacks in some parts of the district. Then, in the following year (2012-13), there would be even more cuts, with enrollment possibly falling another 7% from the year before. The biggest losers, of course, will be our students who are facing a perfect storm of higher fees (up 40% next year), fewer classes, more expensive books and supplies, and to top it off, cuts in federal financial aid. Following closely behind will be part-time faculty who will bear the brunt of the class cuts, not only in this district, but also at other colleges where they might be teaching. There is a growing possibility that for 2012-13 there could be layoffs of staff, and more administration efforts to terminate academic programs for budget reasons, but decisions about layoffs and program terminations for 2012-13 would be made this coming year (2011-12). 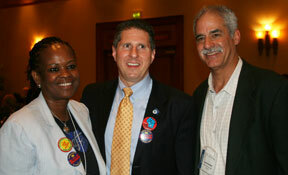 A mediation session with AFT and District negotiators is scheduled for May 23. An AFT 1493 E-News will be sent to all faculty after that date with an update on the situation. With so much attention on California’s and the nation’s budget and education crises, I’d like to debunk some myths that seem to be accepted as truth by many people. • California ranks 45th in the nation in per student spending in community colleges. • Our state ranks 48th in the nation in government employees per resident. So California’s budget problem is not about spending; especially when it comes to education, and in general for public services, we are already doing more with less if compared to other states. The sources of the problem with California’s budget are insufficient revenues and wrong priorities. Fact: While it is true that the federal corporate tax rate is 35% and it is one of the highest in the world, it is not true that corporations actually pay taxes at this rate, because there are so many loopholes. For example, GE ended up paying taxes at a rate of only 7.4% in 2010. In California, corporations contributed 15% of the total state revenue to the state in 1980; today they contribute about 11%. While the corporate tax rate in CA is 8.84%, the actual rate paid is less than 5%, due to loopholes and credits. If these loopholes and tax breaks (which were not in place 20 years ago) disappeared, the state would collect an additional $12-15 billion per year in corporate taxes. 1. California is the only one of the 21 oil-producing states that does not tax oil extraction. Would oil companies leave California if there were an oil severance tax? Considering that in the other twenty states the average tax is 6% and that California oil can only be extracted from California, there’s a good chance they’ll stay and pay a tax. 2. After the passage of Prop 13, real estate is only reassessed when sold. This allows homeowners to enjoy a property tax that remains almost flat over the years; if they move, the tax on the new property will be based on the selling price. The same happens with commercial real estate, but the difference for the state is that commercial real estate tends not to change hands as frequently as residential real estate, so property taxes on commercial property often remain the same for very long periods of time, and the state does not collect tax revenue on the “real” value of this type of property for many years. Fact: In California, the top 1% of income earners (people who average about $1.8 M/yr), have gone from earning 12% of total state income in 1992 to 24% today. They also own one third of the state wealth today. During the same period of time, their tax rate has decreased from 11% to 9.3%. Considering how much their share of the state’s income has increased in less than 20 years and that 1% of the state’s population “owns” one third of the state, it seems that these people are doing pretty well, and they could, at the very least, afford to go back to earlier levels of taxation. By restoring the tax rate for them to 11%, the state would collect over $5 billion in revenues. Fact: Our California Community Colleges (CCCs) may be the best deal in the U.S., but certainly not in the world. Some countries have high quality public universities which are free to students, and this free education is not limited to the first two years of college. In some of these countries (e.g. Brazil, Croatia, Denmark, Finland, Greece and Sweden), admission is competitive, but in others (e.g. Argentina, France and Saudi Arabia) there is open access, just like in the CCCs. These examples show that if public education is valued as a high priority, governments find the way to fund it. If the message that the CCCs are the best deal in the world is disseminated, then the public will be more willing to continue to accept increases in fees. If, instead, we recognize that there are free higher education systems around the world, then we’re more likely to be able to make the case that higher education should be free to students, as intended in the Educational Master Plan created in 1960. Open access to higher education is not enough: $0 is the only price tag that makes education truly affordable to all students. Other countries can offer free higher education, and California used to do so as well not so long ago. In order to adequately fund public education in the state of California, the state needs to address its two real budget problems: revenues and priorities. 1 “How California Compares.” Ed-Data. California Dept. of Education. http://www.ed-data.k12.ca.us. What is the rationale for the disparity between part-timers’ and full-timers’ pay, benefits and working conditions? Despite the fact that the majority of faculty members in the district are part-time, the funding for wages and benefits, health coverage, sabbaticals, pensions and other benefits (as well as scheduling consideration, opportunities for professional growth, office space, and other non-wage/benefit considerations) are disproportionately directed toward, or available only to, full-timers. What is the ideological rationale for pay, benefit and working condition inequality? Not the Equal Pay Act, which addresses wage disparities between women and men. Under the provisions of this law, passed in 1963 under the Kennedy administration, it became illegal to pay a woman less for doing the same job as a man. This prohibition against unequal pay for equal work was extended to more “protected classes” (e.g., race, age, national origin, religion) in 1964, via the Civil Rights Act. The concept of wage parity between women and men, then, has been widely accepted for a half a century. U.S. Bureau of Labor 2009 statistics indicate that women now earn 80 cents to a man’s $1.00, up from 62 cents when gender-based pay differences were first tracked in the 1970’s. Although some sectors have made progress in closing the gender wage gap (women in the military and women in K-12 education earn close to their male counterparts, for instance), wealth disparities between groups is increasing much faster than the wage disparities are closing. According to a 2010 study by Mariko Lin Chang and C. Nicolle Mason, single African-American and Hispanic women find themselves with a median wealth (an individual’s assets minus their debts) of $100 and $120, respectively, compared to single white men’s median of $43,900. This amounts to a wealth advantage of a roughly four thousand percent for white men. With the excessive profit taking of the past two decades, it is not hard to imagine what factors are spiking the “white male” wealth average (no doubt it is the enormous wealth accumulation of the top 1% earners, nearly all male). It is also not hard to see why part-time college faculty—without legal discrimination protection or fair wage legislation—have made so few gains in their struggle for wage parity. One could examine any of the protected categories of worker, for whom the payment of an unequal salary would constitute a civil crime in America (race, age, national origin, religion, for instance) and find some modest progress—particularly in certain sub-demographics. Lawsuits have been virtually the only propellant behind the sluggish increases of less than a half a penny a year. Twenty-six million dollars was paid to 171,000 women whose low earnings were attributable to gender discrimination, and a landmark Walmart class action case is set to go to the Supreme Court this month. A million and a half women are claiming long-standing and systematic wage discrimination by Walmart. Despite the availability of judicial relief, however, the recovery of fifty years of lost wages, presumably trillions of dollars, remains unlikely, even given the Lily Ledbetter Fair Pay Restoration Act (2009), which overturned a 180-day limitation on filing complaints of discriminatory pay practices. But absent any specific legal framework, part-timers will not, presumably, ever enjoy equal pay for equal work, or equal pay protection. Even the Obama administration’s student loan forgiveness program (a cancelling of student loan debt after ten years of service) excludes part-time faculty by apparent design. The great irony is that advanced degrees are a requirement for college teaching. These degrees cost money ($10,000-$100,000 of student loan debt is typical) and time (2-8 years of uncompensated study time—time in which the graduate student is not earning a livable wage), yet the student loan forgiveness program is explicitly denied to those most in need of debt relief. Auto and home insurance companies offer a 15% discount for full-time faculty, but none for part-time faculty. These are just two of over a dozen components of the part-time faculty economic conundrum, but are stealth factors that contribute to the estimated one million dollar lifetime loss of wages that part-time faculty can look forward to and the lifetime wealth numbers. Working within the framework of the contract, it is important to address contract fidelity. The grievance pattern is the clearest indication of where the fidelity problems are. This would seem to indicate that seniority issues (class assignments) and evaluation process misuse are the two most common areas of the contract that are misunderstood or deliberately misused. Your union has asked that the seniority lists be publicly available so part-timers who feel that they are unfairly passed over for a class, could examine the seniority list. Your campus AFT chapter chair is ready to work with you on ALL contract fidelity issues and should be contacted immediately when you suspect a contract violation. Attention part-time faculty: You are eligible for unemployment compensation benefits at the end of each semester. Part-timers are essentially “laid-off” at the end of each semester and are no longer an employee of the District. Since assignments are contingent upon funding, student enrollment, and availability, part-timers have no “reasonable assurance” of continued employment. You should apply for unemployment benefits over the summer break and between semesters, unless you are working another job over the summer or between semesters and you are earning more than your unemployment grant would be. 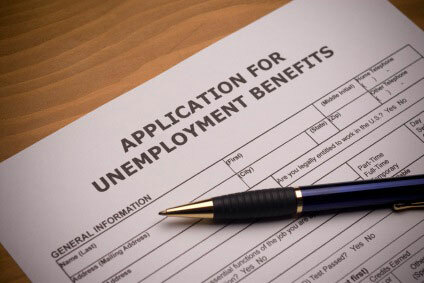 As soon as you give your last final exam, you should contact the local Employment Development Dept. (EDD) office and file a claim, or reactivate the one you have from last winter (if you applied between semesters). If it is a new claim, you will have a one-week waiting period before benefits start, so do not delay. You can also claim for the period between regular terms and summer school. According to the 1989 Cervisi decision of the State Court of Appeals, part-timers, as a class, do not have “reasonable assurance” of a job and hence are eligible for benefits between terms. You should not have any problems, but if you have any questions or are denied for any reason, call Dan Kaplan in the AFT office (650-574-6491) as soon as possible. Our local sent five delegates to the 2011 California Federation of Teachers (CFT) Convention, March 18-20, in Manhattan Beach: AFT 1493 President, Monica Malamud, Executive Secretary, Dan Kaplan, Grievance Officer and Skyline Chapter Co-Chair, Nina Floro, Negotiators Joaquin Rivera and Katharine Harer, and CSM adjunct English instructor Deb Garfinkle. We’ll report here on some of the highlights of the three-day meeting of teachers and staff from K-12, community college and a scattering of four-year schools – 600 elected delegates in all from every corner of the state. During the Friday evening meeting of the Community College Council, locals gave brief reports on how their colleges are weathering this period of massive budget cuts. Union leaders described cutbacks to programs and faculty, stalled negotiations – some in impasse as we are in our district — and various strategies for survival, including a few districts that are looking at a parcel tax similar to our Measure G.
STRS Board member and retired community college teacher, Caroline Widener, told a sobering tale of new threats to the State Teachers Retirement System. She framed the discussion by describing what she called widespread “retirement insecurity” among the ranks of private sector workers due to the failure of 401-K’s and other investments schemes. Widener said we are experiencing a “crisis of public employee pensions”, manipulated by Republican politicians who are tapping into pension and retirement anxiety in the private sector to win budget battles, exemplified by the current losses in Wisconsin. Widener cited recent polls that show a majority of people in favor of public workers paying more towards their pensions, placing caps on the total amount a person can receive, and turning Defined Benefit Plans into 401-K’s. According to Widener, even many Democrats polled are in favor of these changes. Other areas of teachers’ pensions that are being targeted for “reform”: placing a cap on how much salary can be used to calculate a lifetime pension; ending the practice of buying years, referred to as “air time”; discontinuing the practice of adding unused sick days to pension calculations; and changing the formulas in order to force teachers to work longer and retire later. Sixty is the normal age for retirement in CALSTRS. Pension “reformers” compare this to 68, the average age of retirement in the Social Security system. The “Little Hoover Commission” report, recently referred to by Chancellor Galatolo in an email message to district employees, recommends that teachers in STRS pay a larger percentage of their earnings into their pensions. This piece of the “pension reform” campaign is gaining traction around the country. Interestingly, the 500,000 members of STRS are not allowed by law to negotiate retirement contributions, unlike CALPERS that has negotiated increased contributions from members in some school districts. Legally, only new employees in STRS may be asked to increase their contributions, but this law can be changed by the California legislature. Widener urged that we “change the debate”. Rather than focusing on maintaining our retirement security, teachers should advocate that all Americans, in both the public and private sector, have increased security at the end of their working lives. With this in mind, a pilot project has been proposed in which private sector workers can buy into public pension programs. 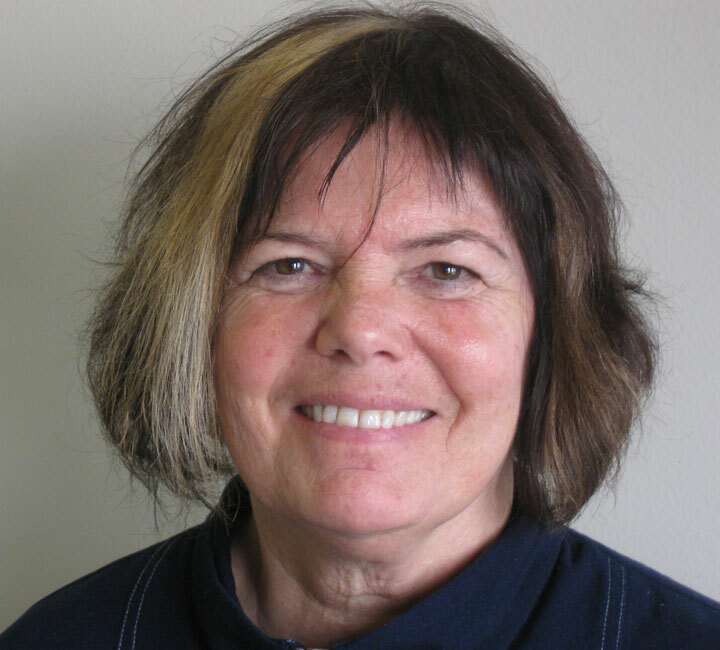 Widener is leaving her seat on the STRS board, but Sharon Hendricks, a CFT member endorsed by the union, is running a campaign to take Widener’s place to ensure that community colleges have a strong advocate on the STRS governing board. After a few more spee ches from colleagues and people who have worked with Marty over the years, he stood up to begin his annual “State of the Union” address. In typical Marty fashion, he recognized the recognition and made fun of himself (ever the parliamentarian) at the same time: “This was very nice – but I think it was out of order.” The ballroom responded with laughter. He went on to look at where we are today. The success of Prop. 25 and the hope for change with a new governor in office are positive signs. “CFT’s wide representation puts us in a good position to provide leadership in the budget battles ahead.” For example, city employees in Los Angeles have recently joined the CFT. Later that day we were treated to a speech by Brian Kennedy, President of AFT Wisconsin, the second largest public employee union in the state. He gave us some background on Governor Walker’s campaign – the closest election in the state in the last 90 years. During the campaign, Walker pitted public sector against private sector employees in an agenda funded by the super-wealthy Republican Koch brothers. As AFT President, Kennedy reac hed out time and time again to the Governor’s office, offering to work with Walker. He never got a response. 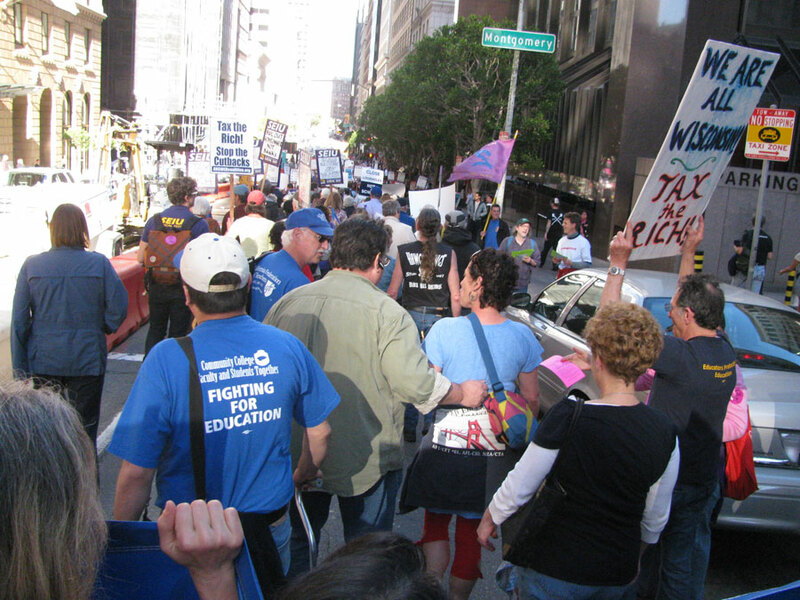 The AFT offered a 0% salary increase for two-year contracts with 16 furlough days, which would amount to a 16% cut in worker’s take home pay, as well as offering to increase workers’ contributions to pensions and benefits. “The Governor did not respond. We reached out and he slapped our hand.” Walker introduced tax cuts for corporations and the wealthy followed up by his “Budget Repair Bill” and the repeal of public sector collective bargaining. Ironically, Wisconsin was the first state to enact collective bargaining as well as to institute the eight-hour day. 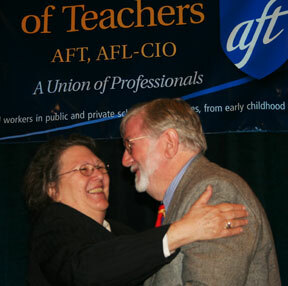 This time, when Kennedy reached out to talk to the Governor about collective bargaining – something Walker had never mentioned during his election campaign – “the AFT slapped back”. “We occupied The People’s House. We brought in our sleeping bags and slept in the capital rotunda.” 25,000 people were bussed in. Organizers moved out to districts beyond Madison and 80,000 converged on the capital. At its highest point, 150,000 people stood in the snow and freezing temperatures outside the capital building. Although the bill passed, it is being challenged in court. “The abuses of the Walker administration have brought his approval rating down to 39%.” A signature drive to recall eight Republican Senators is in full swing and Kennedy believes pro-labor candidates can win in 5-6 swing districts. The over 500 people in the ballroom of the CFT Convention gave Brian Kennedy the longest standing ovation I’d seen since the Giants won the World Series in San Francisco. AFT 1493 wins 6 CFT Communications Awards! 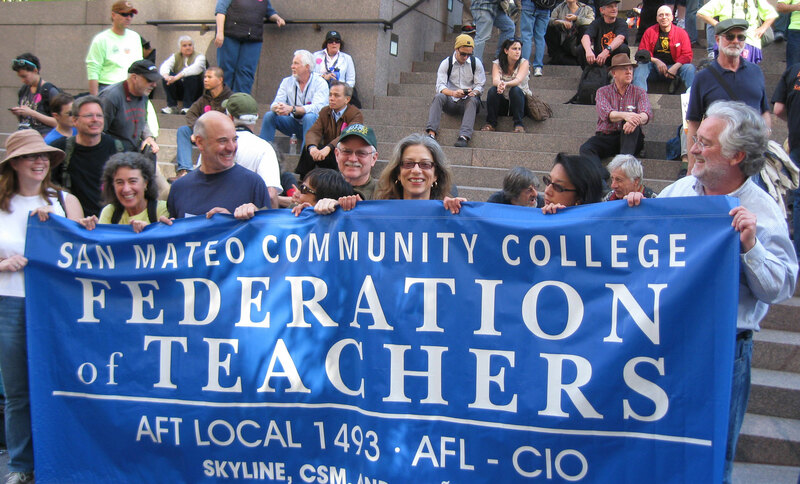 At the CFT Convention March 18-20, AFT Local 1493 won six Communications Awards. We won two First Place Awards, including the Best Web Site for locals with more than 500 unit members for the second year in a row. Merle Cutler won Second Place in the category of Best Persuasive Writing for her Advocate article “One way to reduce college costs: cut from the top”. Katharine Harer won Third Place in the category of Best Feature Writing for her Advocate article “Students protest cuts on campuses, then mobilize in SF for a large, spirited youthful rally”. Monica Malamud won Third Place in the category of Best Single Effort for Locals with more than 500 unit members for the AFT Local 1493 Union Handbook. And Elizabeth Terzakis, Kate Motoyama and Masao Suzuki won an Honorable Mention in the category of Best News Writing for their Advocate article “Hundreds attend teach-ins on budget crisis at all three colleges”. At the March 23 District Board of Trustees meeting, District Academic Senate President Diana Bennett presented a proposal for the establishment of a new Trust Committee to review and revise the District’s faculty evaluation system. The proposal was developed by an AFT-District Academic Senate joint committee, consisting of Monica Malamud and Nina Floro (AFT) and Diana Bennett and Ray Hernandez (Academic Senate) and was approved by the District Academic Senate and by the AFT 1493 Executive Committee. The AFT and Senate believe that the current evaluation system is outdated and inadequate, as evidenced by both an increase of complaints from evaluees, evaluators, and administrators, as well as an ACCJC recommendation to review our evaluation policies and procedures. The original District Trust Committee, mandated by AB1725, was established in 1988 and consisted of 6 faculty representatives (3 AFT, 3 Academic Senate), with ex-officio administrators who did not have a vote. This Committee worked for two years to create the current District faculty evaluation system. The new AFT-Senate Trust Committee proposal argues for the need for the new Committee to take a comprehensive and systemic approach to the development of new faculty evaluation policies and tools. This means that the new Committee would need to evaluate the old evaluation documents, research how faculty evaluation is done at other community colleges around the State, and then engage in discussions and consultations with faculty in all of the various disciplines. After doing all of this, the Committee would then either revise existing language or develop new evaluation policy language. The first step of this process will be to identify and approve four faculty members who will be on the new Trust Committee, two selected by the Academic Senate and two by the AFT. The District administration will select the administrators who will participate in an ex-officio capacity. The District will need to agree to grant the necessary release time of three units per semester to the faculty members selected to do this work for two or three semesters, the amount of time thought necessary to get the job done. The Trust Committee will complete a preliminary draft of new evaluation policies, which will then be shared with District faculty in an attempt to receive feedback from individual faculty members, as well as from members of the Academic Senate Governing Councils and the AFT Executive Committee. Revised evaluation policies and procedures would then be submitted to the administration and the AFT, to be discussed and approved in negotiations between the two parties. It is hoped that the work of the new Trust Committee will begin in the Fall 2011 semester. The goal of the Committee is to create a comprehensive and transparent new evaluation system, which will lead to a reduction in the number of questions and complaints concerning the evaluation procedures from both faculty and administrators. Ultimately this will enable the District to maintain a higher level of competent and accomplished faculty. Title 5 regulations require that community college districts maintain a specified number of full-time faculty—referred to as the faculty obligation number (FON). This number increases or decreases as a district’s funded FTES increases or decreases, and it basically assures that districts do not decrease their ratio of full-time to part-time faculty. After our District passed the parcel tax last June, the District administration became concerned that if it spends parcel tax revenues restoring classes through hiring adjunct faculty, without increasing full-time hiring at the same percentage, it would not meet its FON obligation. The District took the position that they should not hire permanent faculty with parcel tax revenues because these funds are one-time funds, since they are assessed for only 4 years. Following this logic, SMCCCD in January asked the state Community College Board of Governors (CCBOG) to change the calculations for determining the FON number to exclude parcel tax revenues. This would allow the District to hire unlimited numbers of part-time faculty with parcel tax revenue without having to hire any corresponding number of full-time faculty. AFT 1493 disagreed with the District’s proposal and argued against any exemption being granted. There is nothing preventing the District from using Measure G money to pay for additional full-time faculty; the Measure G language actually encourages using Measure G funds to pay for full-time faculty. One of the items that the parcel tax money could be used for is “attracting and retaining faculty”. The AFT also opposed changes in the FON for other reasons, as well: 1) There is a long-term trend in higher education towards the use of more adjunct (part-time and non-tenure track) faculty. In 2009, only 58% of California community college classes were being taught by full-time faculty, far short of the 75% goal. 2) If the FON is not maintained, the percentage of full-time faculty is likely to decrease even more at the very time when the large number of retirements coming soon will free up the resources needed to hire more full-timers. Unfortunately, despite objections from faculty leaders from the CFT and AFT 1493, the CCBOG, at its March 7-8 Board meeting, approved the change to Title 5 regulations excluding parcel tax revenues from the FON.